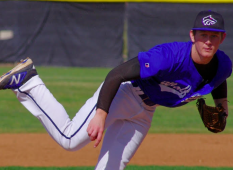 WHHS senior Aaron Barkley defeated Helix with 8-inn, 136-pitch complete game. SANTEE (3-15-16) — Host West Hills scored bookend runs – one in the third and one in the eighth – to stun Helix 2-1 in Monday’s (Mar. 14) Aztec-Foothiller Classic. Senior AARON BARKLEY scattered six hits over eight innings while striking out eight and walking only one to carry the Wolf Pack to its first win in four starts. He needed 136 pitches to complete the job. Both of the Wolf Pack’s runs were unearned but it was good enough to produce a victory. Hits came at a premium as KEATON CHASE accounted for two of the Highlanders’ six hits as CLAYTON LEWIS picked up two of the Wolf Pack’s five safeties. “We gave it away because we couldn’t hit and we couldn’t field,” said Helix coach COLE HOLLAND. That meant the Highlanders wasted a strong pitching effort by JACK STRONACH, who allowed only four hits and no earned runs in six innings. Chase picked up the pace in the seventh and continued on in the eighth but was victimized by faulty Helix defense. He allowed only one hit in 1.2 innings. But an unearned run in the bottom of the eighth cost him the game. Stronach, Chase (7) and Isbell. Barkley and N/A. Isn’t west hills record 2-2? They beat SD high and Helix…. 136 pitches are you kidding me?